One of the functions that mediators serve is to assist people in making decisions. Our obligation is to ensure that people reach decisions that are fully informed and that as part of that process they have full opportunity to gather the data, the guidance, and the criteria necessary to make those decisions. Making decisions of course is never easy, and some decisions are harder to make than others, no matter how much information there may be to guide us. Sometimes, in fact, you just need to sleep on it. As it turns out, “just sleep on it” may be good advice, according to a study conducted by researchers from the University of Amsterdam Department of Psychology and reported today in Science, as well as by the BBC and the Boston Globe. This study suggests that while a rational approach may work well with simple decisions–gathering all the facts and data and carefully weighing the pros and cons–more complex decisions are best left to the unconscious mind. Since these research results remain controversial, you may want to play it safe when it comes to making your own decisions. 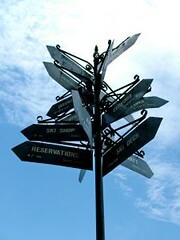 To aid the indecisive, MindTools offers a variety of useful decision-making techniques. For a less scientific approach, you can try using this Universal Decision Maker. Or, better yet, you can simply flip a coin. This entry was posted in Mind and Cognition, Miscellaneous. Bookmark the permalink.